One day, Ford will end up making 1,000 Ford GT supercars for a group of people handpicked from an application pool as worthy enough to spend $500,000 on the car in the first place. But those people may get the car later than expected, since Ford didn’t deliver GTs as quickly as planned its first year of production. The new generation of the GT came out a few years ago with 647 horsepower, a 3.5-liter V6 and seven-speed dual-clutch transmission, and has since been the center of a couple of lawsuits and auction confusion in regards to premature resales. 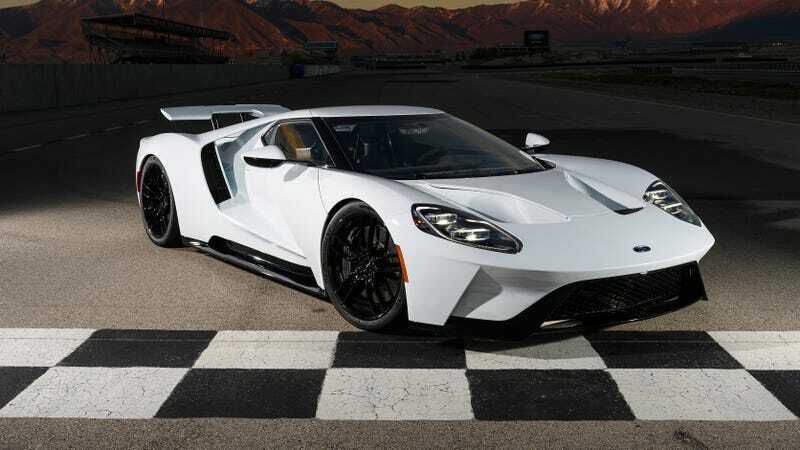 But before all of that, Ford invited people to apply to buy the GT at a $450,000 starting MSRP, saying first it would build 500 and later expanding that to 1,000. The application wave for the last 500 cars opens later this year. But Ford might have some self reflection to do in addition to sifting through those applications, since Motor Authority reports that it and its partner building the car, Multimatic, missed production expectations for the first year. The plan was to build 250 Ford GTs per year for four years, and, according to Motor Authority, Ford only built 138 of the 250 GTs for the 2017 model year. “This is a hand-built supercar, which we are committed to deliver flawlessly. We built into our process an extended ramp-up due to several factors such as global homologation testing and supplier constraints,” a Ford spokesman said in a statement. A follow-up phone call revealed that Multimatic hadn’t built cars on this scale before and it took the company some time to meet its goal of building one car per work day. The first Ford GT came out of the shop in December 2016, but Multimatic didn’t start building one car per day until the middle of 2017. That, teamed with some supplier issues and some minor delays in painting the special Victory cars to commemorate the GT’s class win at the 2016 24 Hours of Le Mans, resulted in the production shortfall for the 2017 model year. The spokesman also noted that things are on schedule for the full run of 250 to be built for the 2018 model year. What’s a little extra waiting around if you were picked as important enough for a fancy, expensive car, right? Greatness can’t be rushed, you know. Nor can it be resold within the first two years of ownership.